A few growers ask me about tissue sampling every season. The conversation is usually initiated after corn is already showing deficiency symptoms. Tissue analysis is a good diagnostic tool to identify the source of the deficiency, but in these cases, does very little protect on increase the yield potential of the field. For tissue analysis to provide real insight about plant growth, the samples must be taken multiple times throughout the season, and preferably across multiple sites within the field each time to provide a representative sample. So is tissue analysis beneficial, and how often are samples to be collected? Most producers that have achieved some high yield notoriety swear by tissue samples. Quite a few factors can falsify tissue sample results. Since tissue analysis is measuring the concentration levels of nutrients in the plant tissue, taking samples during any period during rapid growth is likely going to produce inaccurate information. Secondly, plants under stress will have different concentrations of nutrients when compared to plants growing in favorable conditions. Heat and water stress are the most common sources that foul up tissue sample results, but disease pressure, insect pressure, or recent herbicide applications can put plants in enough funk that results can be skewed. To avoid heat and moisture stress, samples are best taken in the morning hours, and taken approximately the same time throughout the season. The samples must also be representative of the field, so taking a few leaves from one area is not appropriate for quality results. When collecting tissue samples, you must also know which leaf to submit, so you need to check with the tissue sample laboratory for the correct collection procedure. When we know issues that can produce faulty data, and avoid these situations, tissue sampling can be a valuable tool. Tissue samples should not replace a soil sample. Soil samples are a good tool for planning your base line fertility, and tissue samples are best equipped for fine-tuning or making small corrections when weather does not cooperate with your expected nutrient uptake. If tissue sampling for a sidedress application of nitrogen, a Pre-sidedress Nitrogen Test of a soil sample of 24” is also recommended. V6-V8-Plants in this stage are no longer living off the stored energy of the seeds and beginning ear size determination. Rapid nutrient uptake is about to start, so plants can still respond to a sidedress application at this time if nutrients are deficient. V12 (Pre-tassel)-Plants are rapidly taking up nutrients and growing quickly. Nitrogen and Sulfur are our two main nutrients to be concerned with at this point. VT (Tassel)-Plants should have the highest concentration of nutrients at this point. It is still possible to apply foliar fertilizers to offset some deficiency, but responses will be much less than earlier applications. Milk-Plant uptake of nutrients is almost complete and the developing ear is a sink for nutrients so concentrations in the leaf tissues should be declining. Deficiency at this point is almost unrecoverable. Black Layer-A stalk nitrate test at this point will help dial in the next corn crops nitrogen needs. For other crops, the sampling procedure may be different but the timings about the same. Two samples in the vegetative stages and two samples in the reproductive stages should be enough to get a good idea of what is happening in the plant. 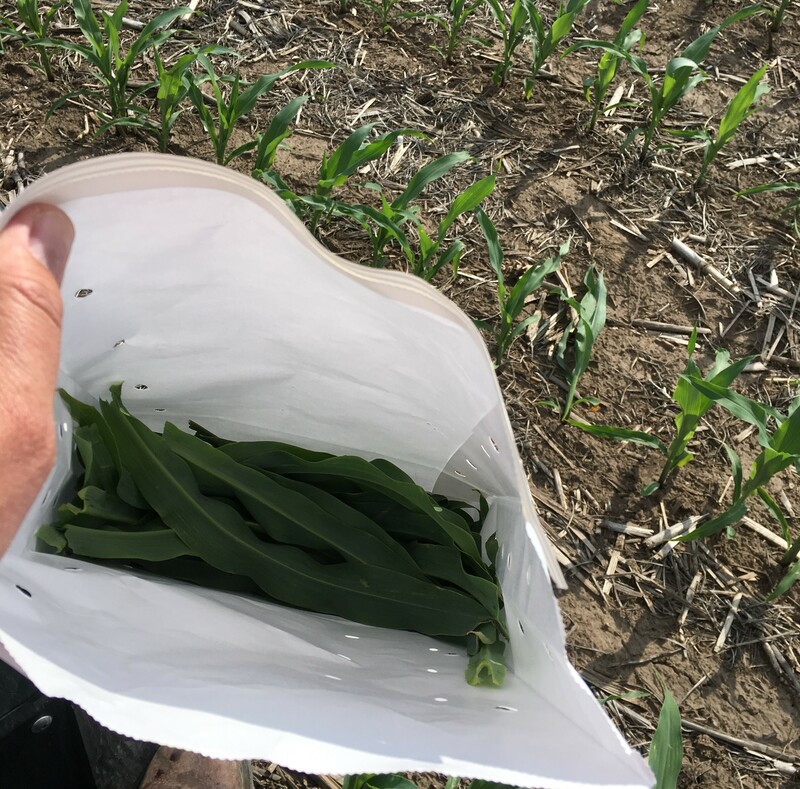 If you are considering tissue sampling this coming season, discuss it now with your Norder Supply agronomist so a plan can be made before the season starts.